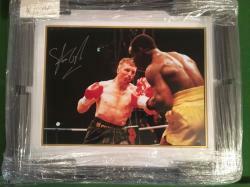 I would like to receive occasional information and updates from Steve Collins 'The Celtic Warrior' and jumblebee. 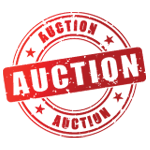 This auction is to raise funds for a teenage boy who's mother, (single parent), sadly passed away suddenly last week. The teenagers name shall remain anonymous, he is gathering funds to pay for his mothers funeral. I know the young man personally and I am donating these items to help raise funds. I will personally meet with whomever purchases these items and present them. 100% of all funds raised are going towards this cause. 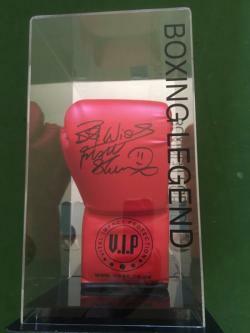 Frank Bruno Signed Glove in display box. 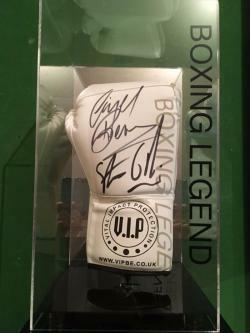 Limited edition dual signed Dark Destroyer 'Nigel Benn' and Celtic Warrior 'Steve Collins' Glove encased.